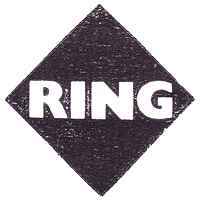 In the 1990-s an important part of Ring's profile was reissuing well known classic rock, progressive rock etc. albums. Discogs marks many of these releases as Unofficial, although they did follow the Hungarian copyright law of the time, so technically they are not bootleg, pirate, counterfeit releases. According to the Hungarian copyright law of 1969 every release older than 20 years became public domain. (This was prolonged to 50 years in 1994, and from 1999 Hungary's copyright law harmonized to EU law regulations.) Although Hungarian music companies accepted a self-regulating code, Ring did not adhere to that and in the '90-s they used the loophole in copyright law to release classic albums from a wide array of classic pop and rock artists from ABBA to Yes. Their releases had the BIEM Artisjus' logo and SID codes indicating that they are official releases, despite the fact that even then many would consider their practice as unethical. This practice lasted until 1999-2000, when it became punishable by law. It is important to point out that Ring did not only operate as a company releasing cheap priced old recordings, but they also issued current Hungarian artists as well.